The Role of Sherpa Culture in Nature Conservation, by Tenzing Tashi Sherpa (2016) is an insightful, beautifully illustrated celebration of Sherpa ICCAs in the Mt. Everest region of Nepal. The book presents the research, writing, and photographs of a Sherpa elder and leader from the largest of the villages within Sagarmatha (Mt. Everest) National Park and World Heritage Site, the high homeland that the indigenous Sherpa people call Khumbu. Tenzing Tashi Sherpa is the president of the Khumbu Sherpa Culture Conservation Society, the first Sherpa indigenous people’s organization for cultural and nature conservation, and the coordinator of the ICCA Network Nepal. His book explores the many ways in which the Sherpa people contribute to conservation through their culture, including their Buddhist religious values and practices. Illustrated with over one hundred photographs, The Role of Sherpa Culture in Nature Conservation documents Khumbu’s importance as a beyul (sacred hidden valley) in which all life is protected, its many sacred mountains, lakes, forests and trees, springs, shrines and other cultural sites. 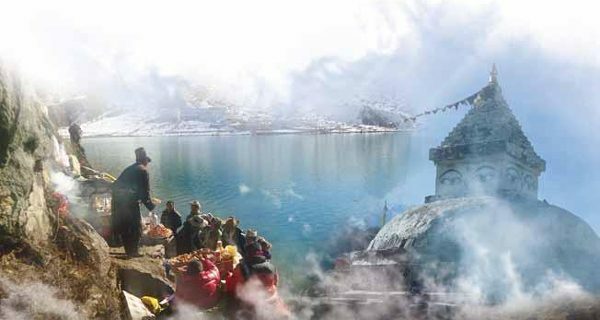 It describes the Khumbu Sherpas’ yul thim/nawa (village assembly/custodian) system of governing and managing their forest and agropastoral commons through rules and regulations (di) and the rotational closing and opening of zones. The book culminates with a survey of the many activities being carried out by the Khumbu Sherpa Culture Conservation Society, such as documenting and mapping ICCAs, giving presentations on Sherpa culture and ICCAs in regional schools, and leading school fieldtrips and multi-day cultural treks to ICCAs and cultural sites. This book is highly recommended for anyone interested in ICCAs, the Mt. Everest region, and the Sherpa people.